The Bureau of Engraving and Printing (BEP) today at 8:00 a.m. 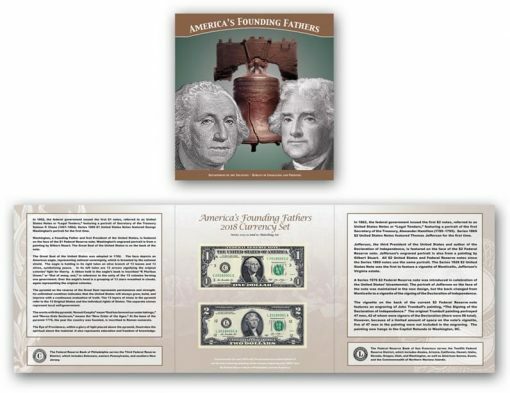 ET released its latest product for money collectors, the America’s Founding Fathers 2018 Currency Set. 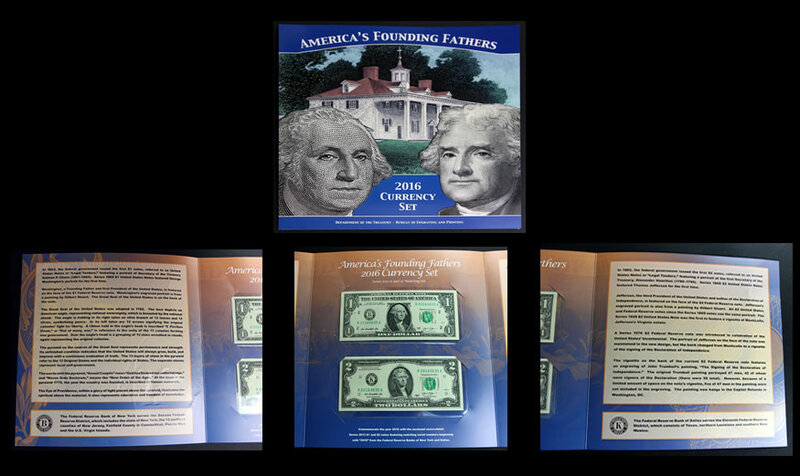 Annually released and at the same $21.95 price since 2014, this presidential set includes two notes that share matching serial numbers beginning with 2018. Inside an attractive tri-fold folder are a Series 2013 $1 note from the Federal Reserve Bank of Philadelphia and a Series 2013 $2 note from the Federal Reserve Bank of San Francisco. The pair of notes, of course, respectively features founding fathers George Washington and Thomas Jefferson. The folder’s center panel holds the notes within a clear, polymer sleeve that is acid-free. The left and right side panels offer information about the currency and their engravings. No more than 5,000 sets will be sold, according to the BEP, paralleling the limits of past issues since 2015. The BEP established a limit of 3,000 sets in 2014 and those apparently sold out too quickly. The BEP’s shopping site lists every America’s Founding Fathers Currency Set since 2012. Most are tagged as "sold out." Regardless, these series of products are available only during the calendar year of their release — if they do not sell out beforehand. Collectors can order as many sets as they want with bulk pricing available at $18.95 for quantities of 50 or more. Place orders using the BEP’s online store www.moneyfactorystore.gov, or by calling 800-456-3408. The BEP ships free and does not charge tax. The BEP ships free. Hint, hint to the Mint. Memo to Self: Federal Reserve Notes are called that for a reason…regardless of their designated denomination, they’re still only worth about as much as a Post It. The BEP still has limited edition products dating back to 2012 that haven’t sold out yet. Some are great sets, but fewer people are collecting modern USA Federal Reserve Notes, especially the $1 & $2 FRNs that haven’t had an anti-counterfeiting design update in like forever!